Sometimes I get hair-brained ideas to build something that just seems cool. My Mom says my Grandpa was the same way. We prefer to build something rather than buy it if possible because we know we can do it just a little better (my own pride added there, for a bit of good measure). I had a friend when I lived in PA that had an apple orchard and a cider press. I remember a time or two going to her place and gathering apples and pressing cider. Like most things home-grown, freshly pressed cider is better than store bought any day. 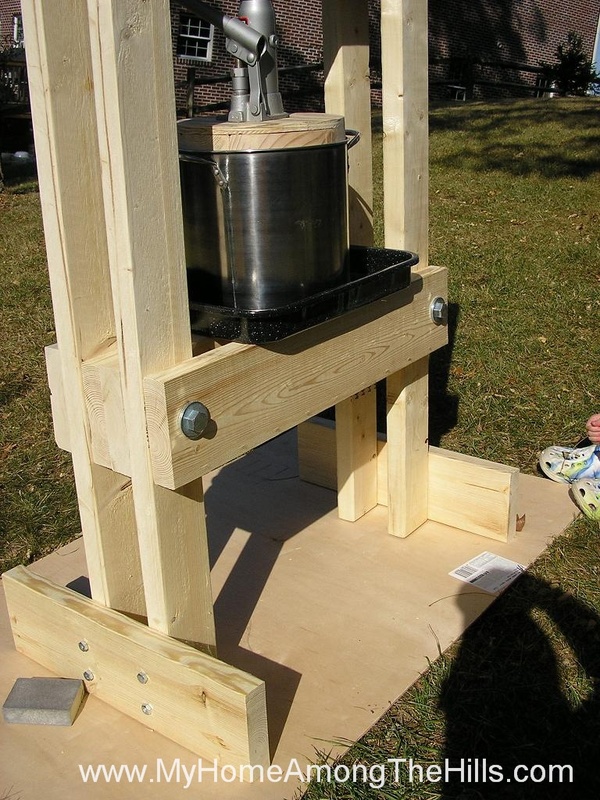 So, my hair-brained idea this month was to build a cider press. I had some scraps left over from the shed and a bottle jack from another hair-brained idea so I built this press from the left-overs. My only real expense was a stainless steel stock pot (from Big Lots – $10) and a roaster pan to catch the cider ($5 at BL). By the way, to drill holes in stainless steel, make sure you have a good, hard, sharp drill bit. Anyhow, the idea is that the round wooden block(made by edge gluing 3-2x4s and then gluing 2 pieces of half inch plywood to the sides, then coated with mineral oil to seal it) will sit upon smashed apples and will be pressed down into the stainless pot with the bottle jack. The cider will drain out through the holes in the pot and into the roaster pan. I have seen some fancy apple smashers, but for this project, it was much faster and more macho to use a new sledge hammer. I washed the new hammer and coated it in polyurethane. To smash apples, we’ll simply drop it on a bucket full of apples until they are pulverized. While the press could crush whole apples, to make proper cider, the apples must be smashed prior to pressing. Someday I may make a normal apple smasher but this will do for now. I coated the frame of the press in polyurethane to protect it from the elements and to make for easier cleanup. We haven’t tried it yet as the poly is drying (poly is food-safe once properly cured by the way), but I expect we’ll have cider this weekend. I’ll post again to let you know how it goes! 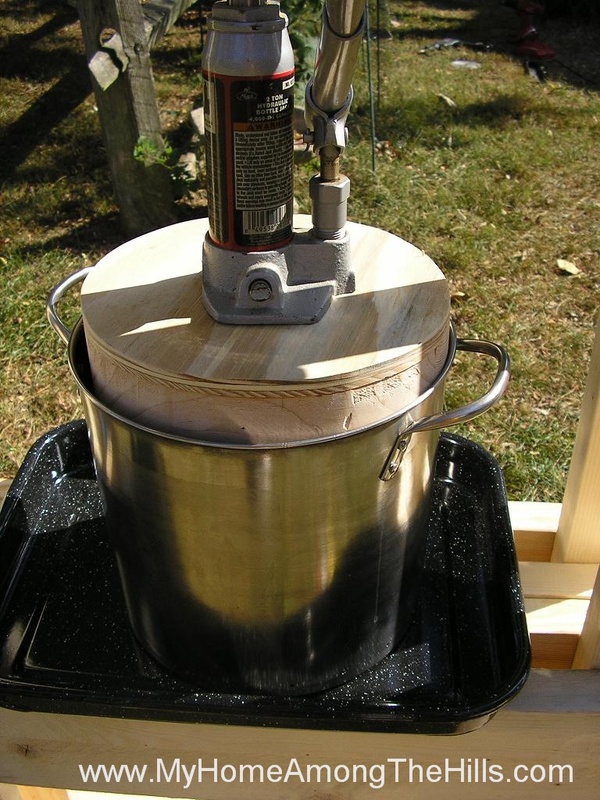 Homemade cider is so good – and that press looks like it will work wonderfully. Great idea..
And that web site has a lot of other plans, fur when u wants to get building things. The warren, you are an extremely talented man. 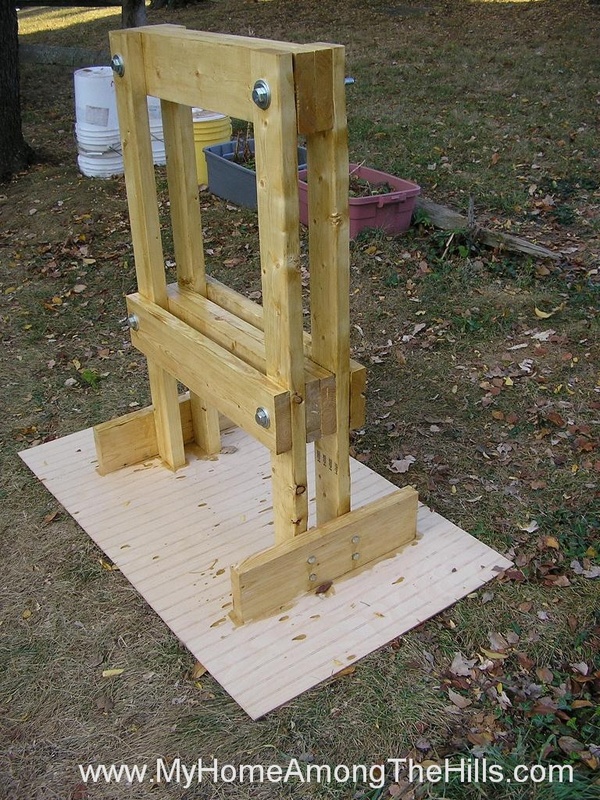 That’s a beautiful looking cider press. I’m impressed. 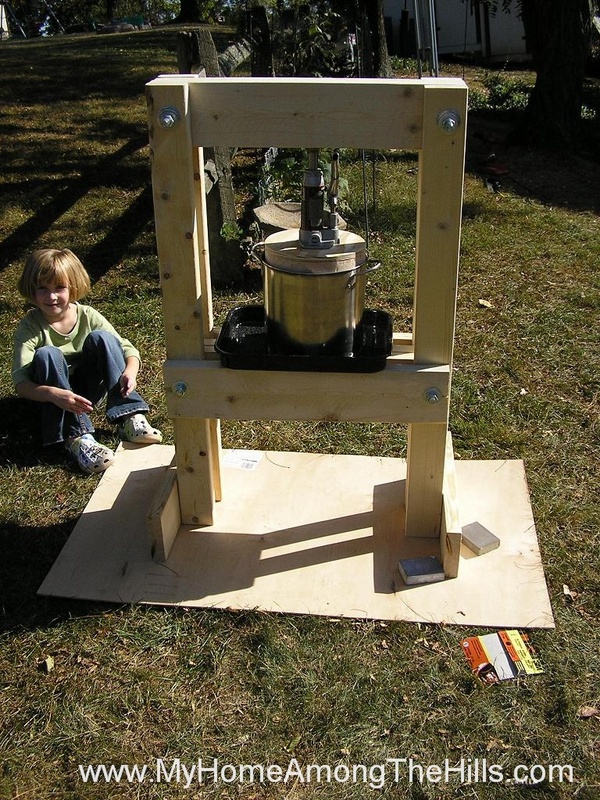 (Also a very cute cider press model, too. lol) Looking forward to hearing how it works! I have looked at apple presses in antique stores, but they were either missing parts or the price was ridiculous! If you don’t mind me asking- how much do you have in materials? You ought to make up a pattern for building one of those and sell them!! I would buy one!! Cool! Can’t wait to hear when you take a batch of apples from start to finish in that thing! Your kids must love helping out. In trying to come up with an interesting present for a five year old’s b’day party coming up, I thought of a manual apple peeler. Have you ever seen those things that slowly turn an apple while a blade peels it? I thought kids would find that interesting in the same way they find a apple press interesting. There’s always a crowd of waist-high kids watching the cider press at our local fair. And NOTHING beats fresh cider! I can’t wait to try it this weekend. I’d like to get video of the kids pre-mashing the apples but we’ll see how that goes. I love having scrap laying around…actually, I like it when I need it and hate it the rest of the time. Anyhow, this was a fun use of stuff! Farmgirl_dk – if you think the press model was cute, you should see the builder! 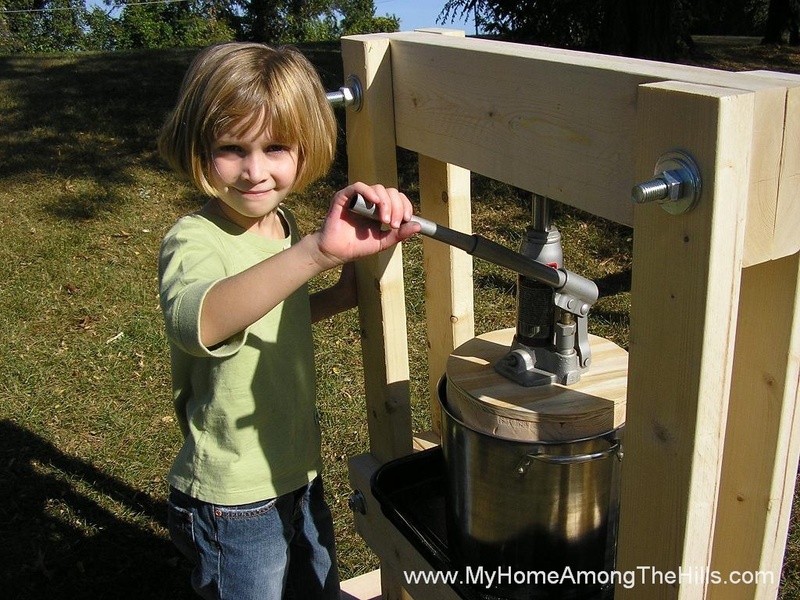 Lynnie – We just got a manual apple peeler and made apple jelly with it. I have some pics up a few posts ago. Abigail liked using it though Isaac couldn’t have cared less. I really liked it though so get one for yourself if nothing else! That’s awesome, Warren! Nice craftsmanship! That is the coolest idea ever, Please let us know how it works for you. I too love to build things and this sounds like a great project. Thanks buddy. Thank you for showing. This is good looking and very well done!